With the average electric bill for US homes reaching sums well over $100 per month, many people are starting to slowly convert their home’s energy source to solar. There are many benefits to solar energy. The cost savings associated with harnessing the power of the sun is most obvious, and typically the most incentivising. But solar power also limits the reach of fossil-fuel power providers who are infamous polluters of the environment. Solar is also a cleaner, more sustainable electricity. Additionally, in some regions of the country, there are tax incentives to switching over to solar. While this savings may pay off in the long run, often times, the cost of solar panel installation is too much for homeowners to justify a full conversion. With that in mind, there are plenty of individual devices one can adopt to their daily lives that will help pad the wallet for a full-on switch to solar down the road. Here is our list of the top five solar products for home use. Walk into any home in America and you will likely see one or more cell phones refueling at wall outlets. While the draw of these phones is low, constant charging can add up. 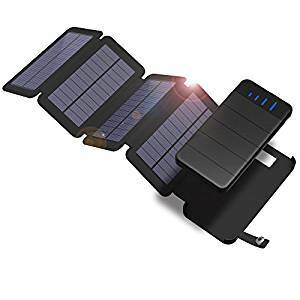 A good first step for anyone thinking about solar is to purchase a solar cell phone charging port. Our favorite is the XD Design Solar Window Charger. Though its panel is small and does not provide the same level of juice as some others on the market, the XD is designed to mount to the window. This makes it easy to hide beneath a curtain or blind- perfect for use throughout the day. Outdoor solar lights work by storing the solar energy it draws during the day for use at night time. This seems like a pretty simply concept. Still though, many models on the market are somewhat complex to the novice user. 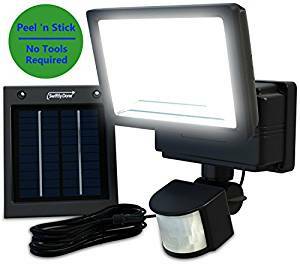 This is why we recommend the Swiftly Done Peel-n-Stick Outdoor Solar Light. The Swiftly Done even allows for optimal energy savings by dimming when no motion is detected and visa versa. A lamp is another common household electrical device that does not necessarily draw a ton of power, but think about how many individual lamps you have around your home. A solar powered lamp is just another way to limit your electricity use with a product that is essential to your everyday use. 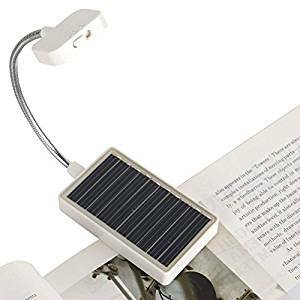 The Solar Clip on Book Light is light wat, foldable, and touchscreen powered making it truly feel high tech. With this lamp you can adjust brightness and even set it to an eye protect mode. Your PC uses quite a bit of power as it is. There is no need to add to that draw with all of its accessories. The Logitech K750 Wireless Solar Keyboard for Windows charges from either artificial light or the sun, meaning you do not need to have direct sun access in your workspace or home office to enjoy the benefits of this product. It is also a super efficient product holding a charge for 3 months even in complete darkness. At less than 1″ thick, the sleek and sophisticated design only adds to the already significant consumer appeal. If you are still on your region’s electric grid, you have likely lost power at some point. In areas that are especially prone to storms, or where the electric grid tends to be unreliable, it may even be standard practice to own a generator. With a full solar conversion you can pretty much avoid power loss all together, but we are not there quite yet. 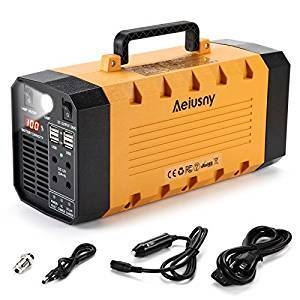 Instead, prepare any sort of power loss with a product like the Aeiusny Generator. This device is not enough to get your house back up and running, but it will certainly power smart phone chargers, PCs, and lights. It also has a AC inverter. There is no doubt that in due time a clean, alternative energy source will be readily available in any home. Right now though, converting to solar power is not quite as easy as it may sound. This is an unfortunate truth, especially since the technology has existed far beyond the point where its novelty would drive its cost. For now, all we can do is begin the slow adoption of solar in our homes using individual solar devices. The five listed above are the nest of the essentials, perfect for anyone looking to begin a cleaner and more cost effective lifestyle.